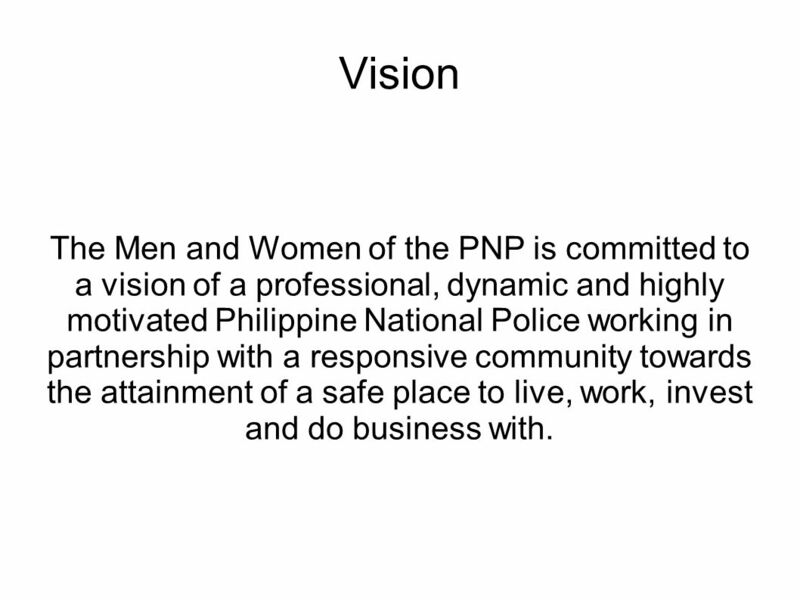 7 Vision The Men and Women of the PNP is committed to a vision of a professional, dynamic and highly motivated Philippine National Police working in partnership with a responsive community towards the attainment of a safe place to live, work, invest and do business with. 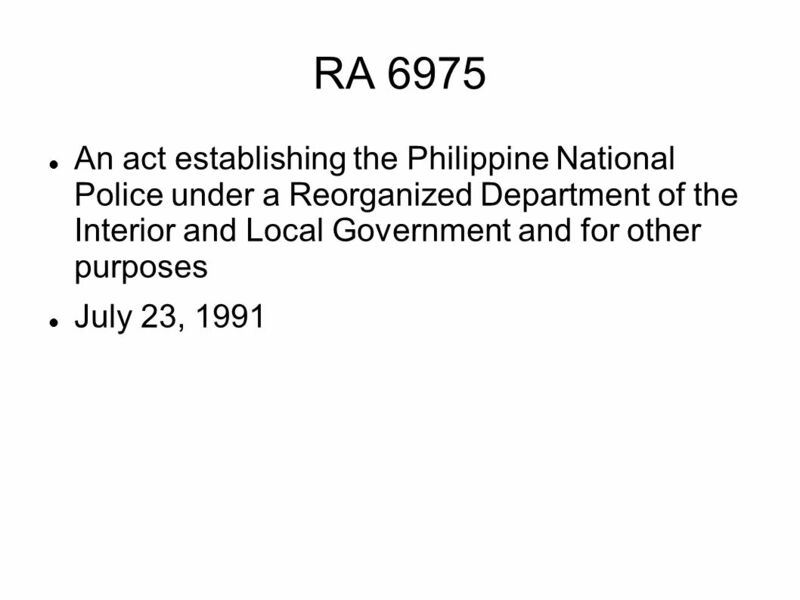 8 Mission To enforce the law, to prevent and control crimes, to maintain peace and order, and to ensure public safety and internal security with the active support of the community. 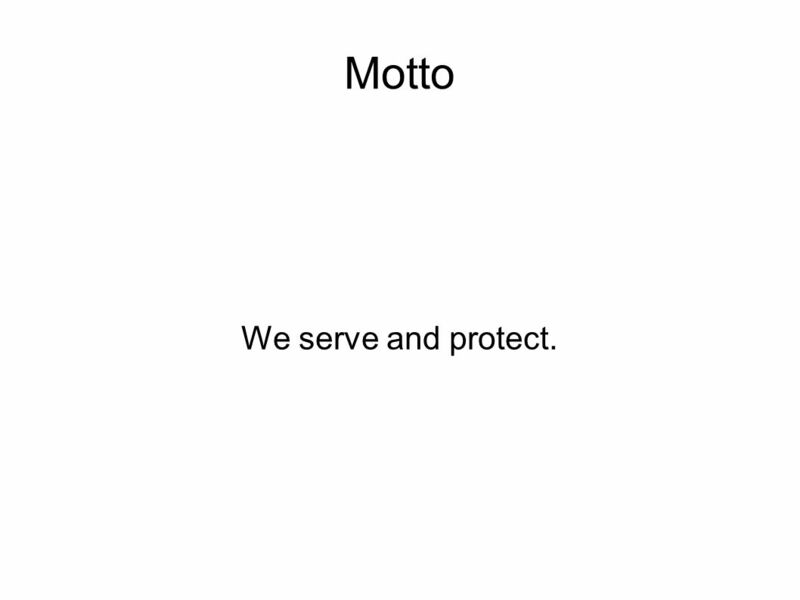 10 Motto We serve and protect. 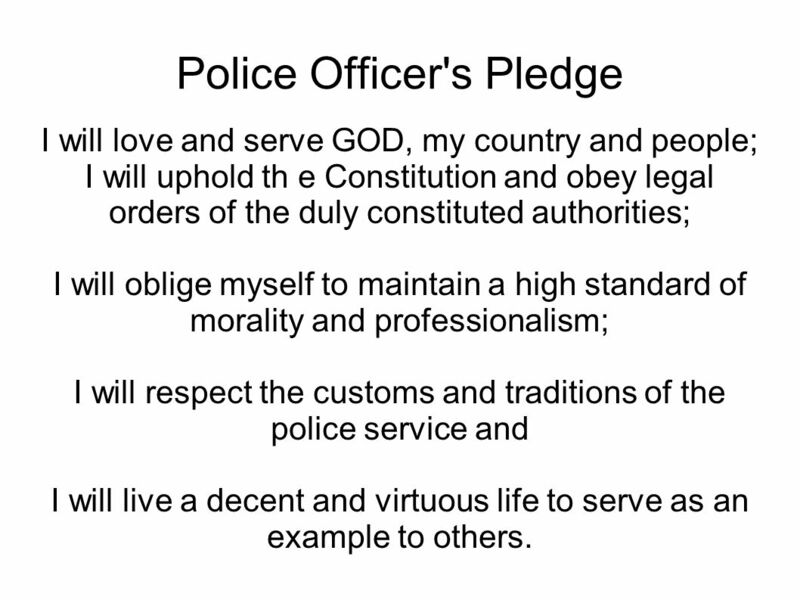 I will love and serve GOD, my country and people; I will uphold th e Constitution and obey legal orders of the duly constituted authorities; I will oblige myself to maintain a high standard of morality and professionalism; I will respect the customs and traditions of the police service and I will live a decent and virtuous life to serve as an example to others. 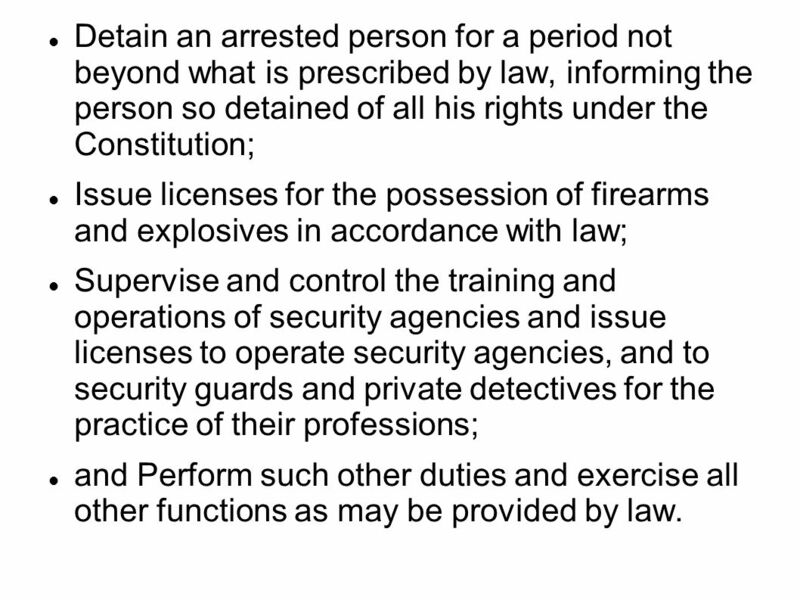 13 Detain an arrested person for a period not beyond what is prescribed by law, informing the person so detained of all his rights under the Constitution; Issue licenses for the possession of firearms and explosives in accordance with law; Supervise and control the training and operations of security agencies and issue licenses to operate security agencies, and to security guards and private detectives for the practice of their professions; and Perform such other duties and exercise all other functions as may be provided by law. 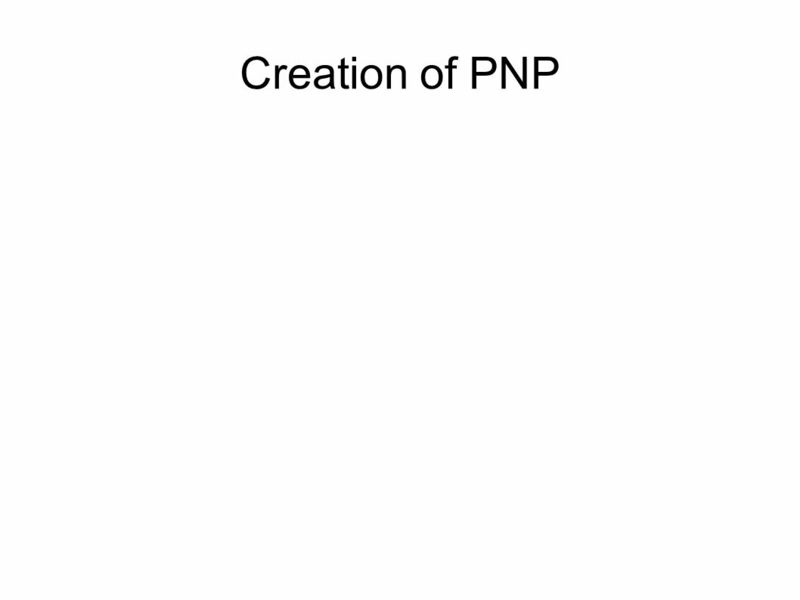 Download ppt "Creation of PNP." Data Protection & Human Rights. Data Protection: a Human Right Part of Right to Personal Privacy Personal Privacy : necessary in a Democratic Society. Polish National Police. 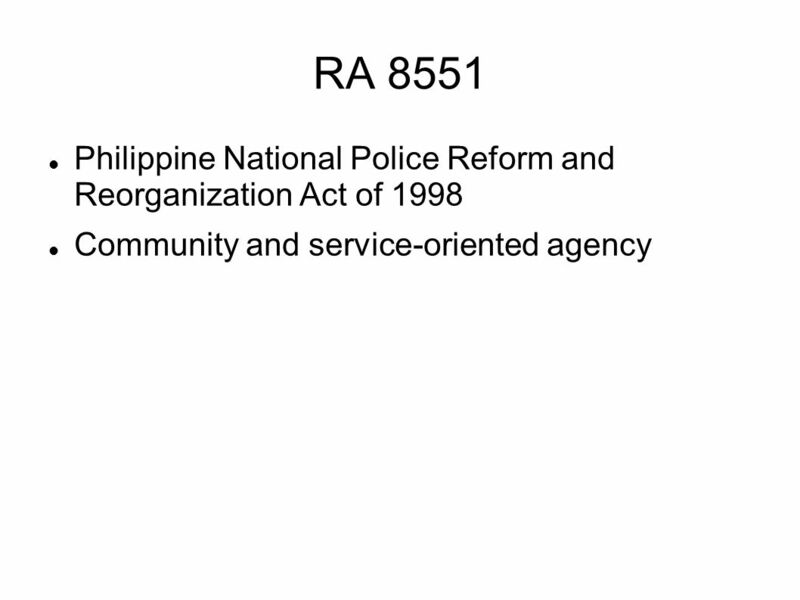 Functions and powers According to Article 1 of the Police Act of 6 April 1990, police in Poland is an armed organization, employees. Towards a framework for integrated cross-border law enforcement initiatives Based on the Consultation Paper circulated to CACOLE in July 2008 by Public. 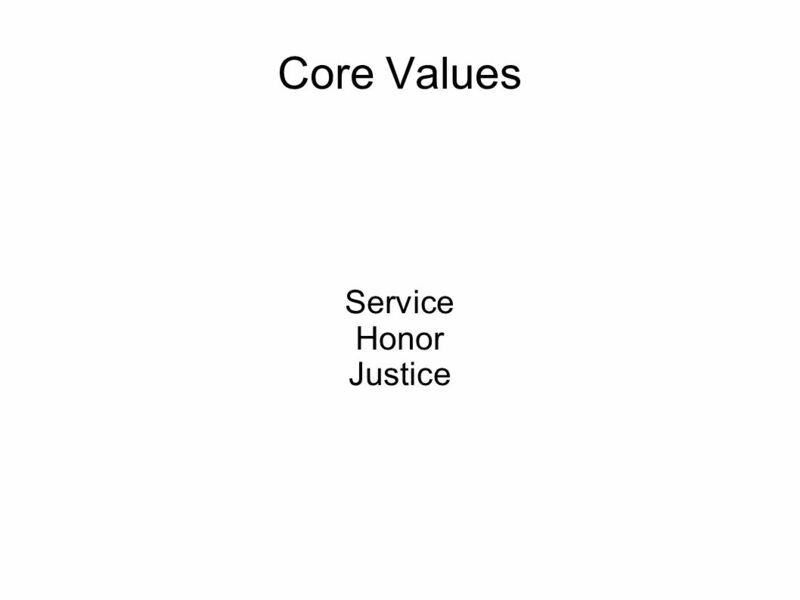 Mission -v- Vision What is the difference between a mission statement and a vision statement? 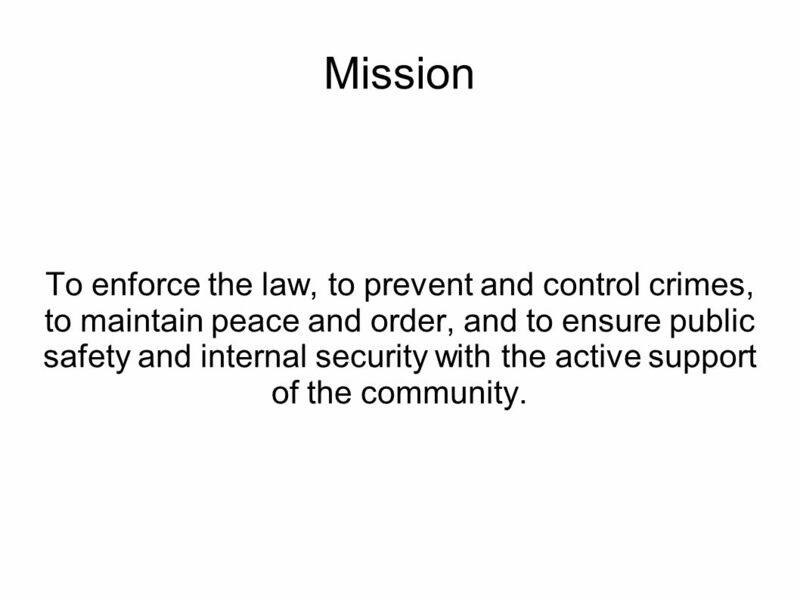 A mission statement is what an organization is all about. Police Integration & Oversight Canadian Association of Civilian Oversight in Law Enforcement June 2009. 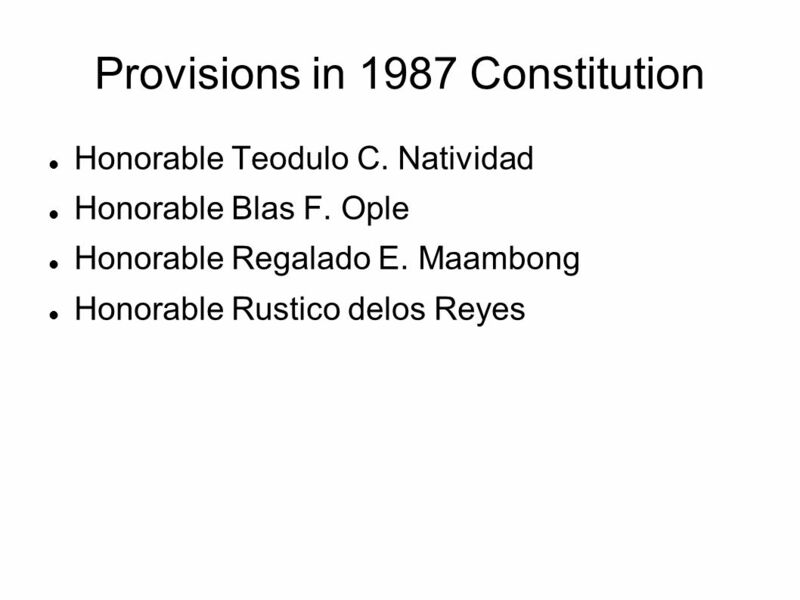 SAGALA PLEDGE. By God’s help I promise to: Love and serve God and my country Be a friend to all Respect my leaders and Keep our law. Probation in Albania. Probation Service was established in 2009 Key legal changes in 2008 EU Twinning working with English Probation 10,000 cases in past. 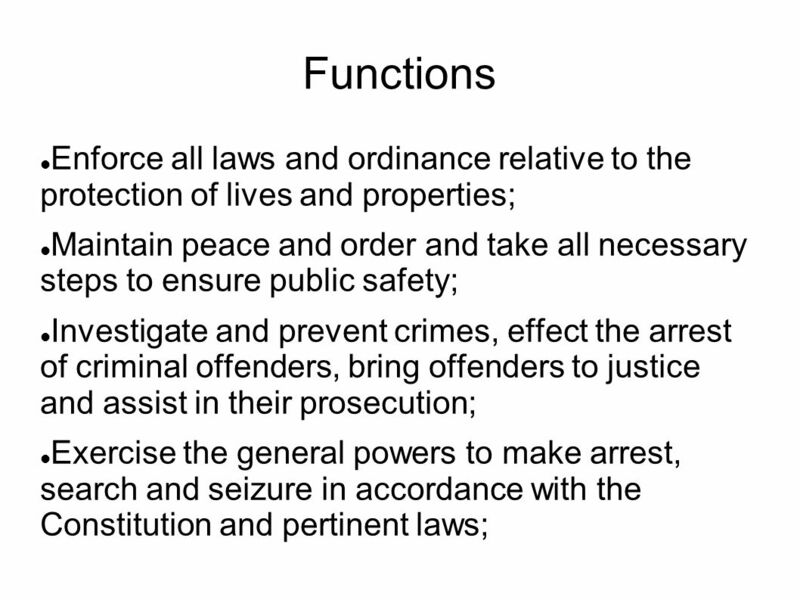 Chapter 3 The Public/Private Interface and Legal Authority. 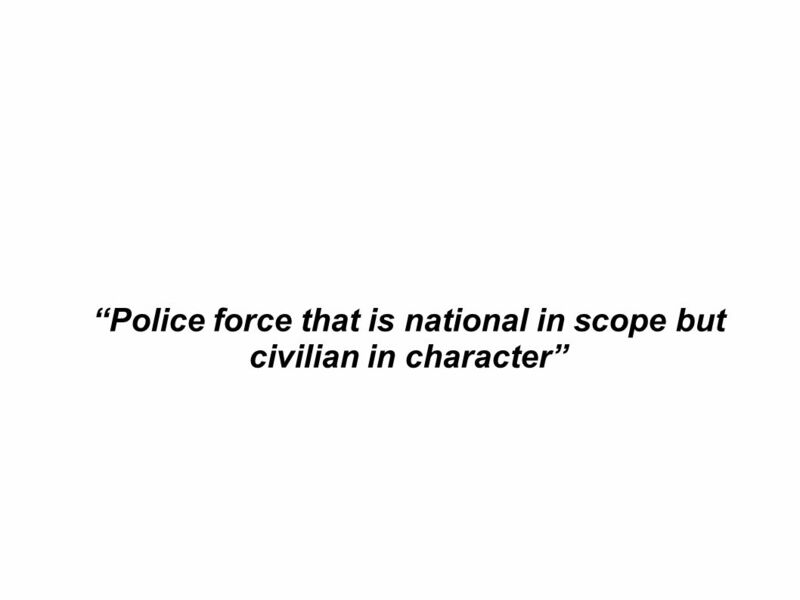 Ethical Justice Chapter Six: Ethical Issues for Police Officers & Criminal Investigators. Police Brian Pattullo, Chief of Police Informational Overview. Essential Standard 1.00 Understand concepts of the legal system, trial procedures, and ethics. Unit A Business Law. 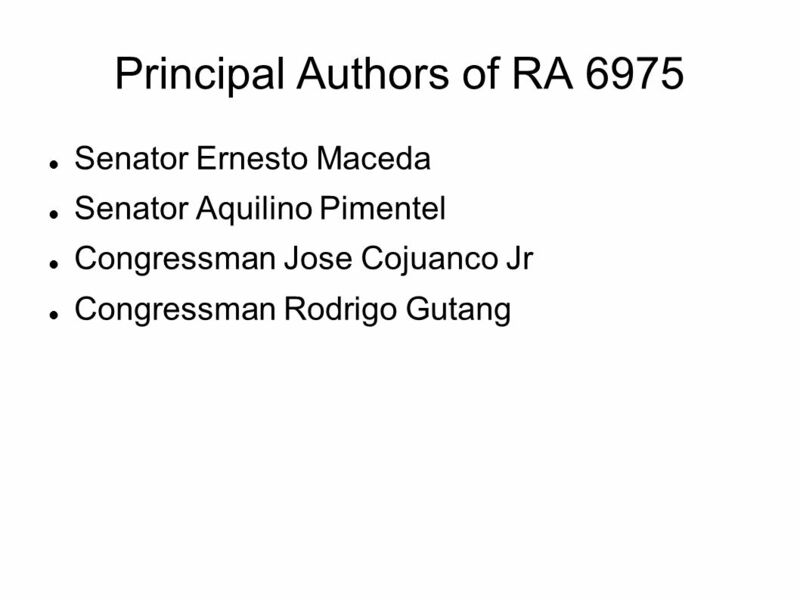 B UREAU OF A LCOHOL, T OBACCO, F IREARMS, AND E XPLOSIVES ATF. A/DCI Shelley Hudson Northumbria Police Child Abuse Investigation Unit.